Nestled in the Austrian countryside just outside of Graz Geidorf lies a neat and compact home, which is both unique and intriguing. It is to here we are travelling today to tour an architecturally designed dwelling, boasting abstract design features which brim with personality and flair. The city of Graz is the second-largest city after Vienna and features a range of different architectural styles. As the 'Old Town' is one of the best preserved city centres in central Europe, the style of dwellings seen here are generally historic, with a strong focus on heritage and restoration. 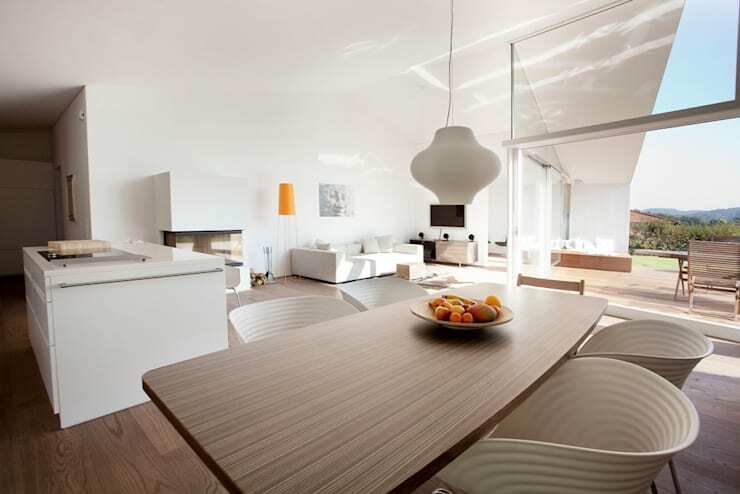 It is for this reason that our feature home today is a standout in terms of its alternative modernist design and form. With an ambitious budget and restrictive zoning conditions the award-winning team at Love Architecture and Urbanism set about producing a strikingly sleek abode that is both offbeat yet highly liveable. Replete with large living spaces and cohesion between the interior areas and the exterior garden, the home is a piece of art as much as it is a residence. 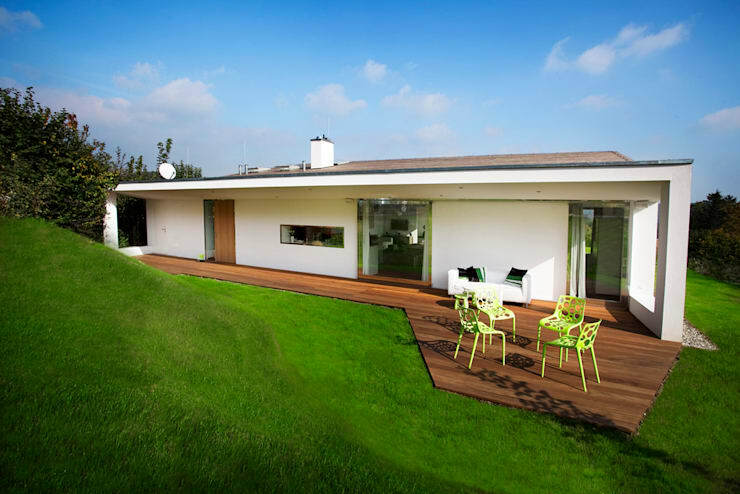 If you would like to take a peek inside this luxury Austrian home, check out the images below and gain some domestic inspiration for your own home today! From every angle this home appears different; a unique and changing residence that provides the structure with personality and a life of its own. The dwelling has been designed with strong lines and angular shapes that create an abstract appearance, with a sense of openness and environmental cohesion. The structure has been built using brick and concrete walls as well as a reinforced concrete roof. 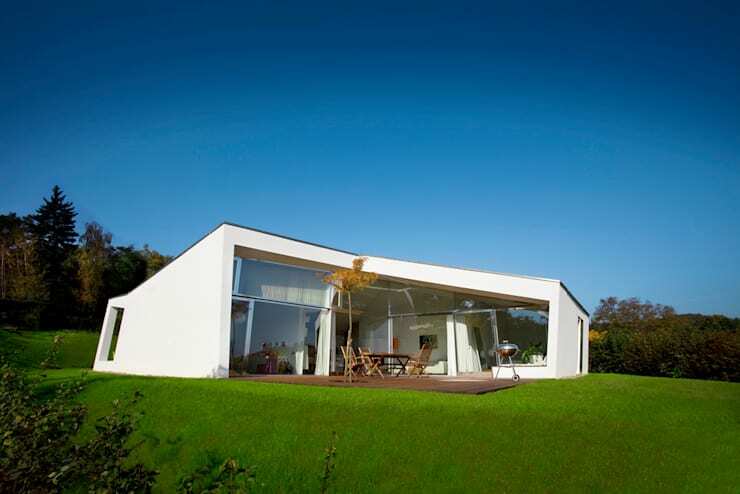 This provides the thermal mass for the house, keeping it cool in the summer and warm in the winter. Playful and optimistic in its form, this home exudes inventiveness, and is a welcome slice of modernity in this typically traditional city. Boasting a large plot and gorgeously trimmed lawn, the home is a statement upon its landscape, imparting ingenuity and contemporary character. Throughout the home there have been several textures and tones that are repeated. The timber floorboards offer rustic charm with a hint of countryside charisma, while the sleek white colour scheme is effortlessly chic. Abundant glazing features prominently throughout, and injects ample natural light into the interior spaces. Here the white colour scheme works beautifully to reflect the light within the room, offering an airiness and light-filled interior that is inviting and warm. Moreover, storage has been added neatly with the inclusion of wall-mounted shelving. This creates yet another texture to the interior space, and provides visual interest. 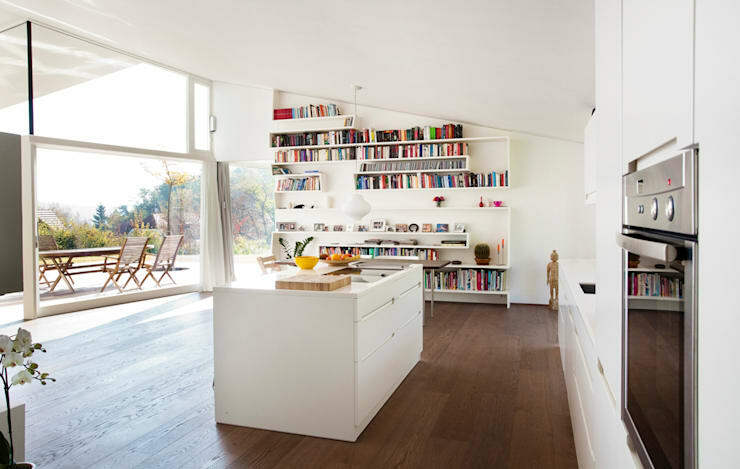 Due to the construction of the home's 'saddle roof', the interior spaces enjoy areas with a ceiling height of up to four metres. This gives the perception of a large and spacious interior, adding to the sense of luxury and opulence. Centrally heated by a large fireplace, the open plan living area is the beating heart of the dwelling, providing warmth for the other rooms. In order to create a sense of cohesion between the different living zones large sliding doors have been installed between the rooms. This allows them to connect, creating a movement and flow throughout the spacious structure. 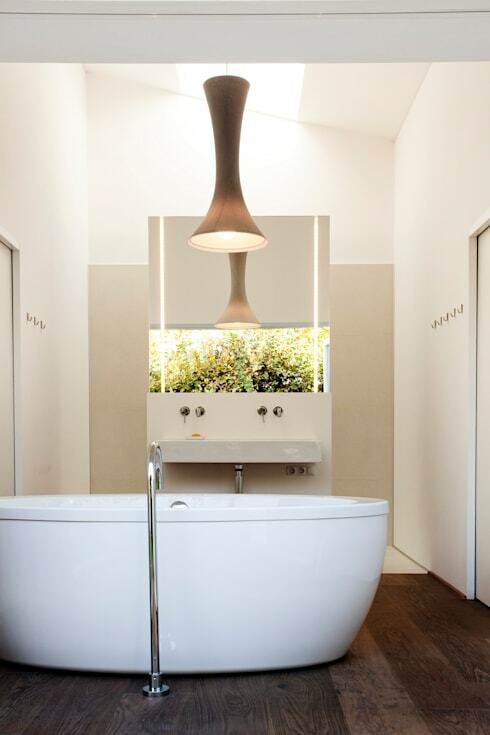 One of the finest rooms within the home is the bathroom. Thanks to the layout and construction of this dwelling, the bathroom is provided a private terrace upon which the outdoor shower sits. Accessed via large French doors, the whole space can be opened up to allow the bathtub to feel as though it is part of the garden and exterior space. Weather permitting, this allows one the serenity and tranquillity associated with a deep connection to the surrounding landscape while using the home's facilities. The colour scheme is a bright white hue, with statement light fittings that evoke a sense of individuality and personality within the room. The freestanding tub is a sign of opulence and lavish indulgence, offering an area to truly relax and unwind. As we take one final look at this home, we move to the rear of the dwelling to view the entrance and entertaining space. Here the decked terrace blends seamlessly with the manicured lawn, adding a sense of cohesion between the built structure and the natural environment. Ideally located chairs and a sofa sit ready for one to take in the sunshine and maximise their enjoyment in this large and open garden. Here in this image the dwelling looks minimal, it has the appearance of a typical home, but hides its surprises for the explorer to reveal once they enter the property. Did this dwelling inspire you to update your home? If you'd like to see more, check out The Sunset Red Home with a Thatched Roof. Would you like to live in this house? Let us know what you thought of this project by leaving a comment below!